Introduction: No matter how little or how much you fish, anglers should always protect themselves against the ultraviolet rays that are so deadly to our skin. How often have you had a great full day on the water, only to pay for it the next week with painful burns and peeling skin? Protect yourself with Blue Lizard, an Australia made suncream that is formulated to provide a broad-spectrum of UV coverage. About Blue Lizard: Blue Lizard originated from Australia where the sun is especially scorching during the summer months. Today Blue Lizard is a division of Crown Laboratories, a pharmaceutical company located in the United States that produces products for dermatology, oncology, and pediatric and dental markets. They produce different creams for UV protection catering to everyone from infants to adults. Impressions: You wouldn't expect much of an eye opener from a bottle of sunscreen, but the Blue Lizard is pretty unique in that the patented "Smart Bottle" will turn blue in the presence of UV rays. At first when unpacked indoors, the bottle is white, but once I took it outside I noticed the bottle started to turn blue immediately. You might think this is just a special marketing gimmick, but we'll look into that some more during our outdoor tests. The Formula: It's good to know that a well known and trusted pharmaceutical company like Crown Labs produces such an important product consumer use. There are two types of sunscreen available to us today, physical and chemical. The physical sunblocks are opaque and will reflect both UVA and UVB while the chemical sunscreens will usually only absorb UVB radiation. The Blue Lizard sunscreen uses active ingredients that put it in the physical sunscreen category. The main element of the formula that plays an important role in providing a wide range of ultraviolet protection comes with the Zinc Oxide. While other active ingredients provide that barrier from different wavelengths of UV rays, the addition of Zinc Oxide gives Blue Lizard a broader spectrum of coverage that helps reflect those harmful rays away from our skin. Real World Tests: There's no better way to test the Blue Lizard suncream than going out fishing all day in some 90 degree heat. In direct sunlight, we can fully apply this Australian-tough sunscreen not just in UVA and UVB protection, but also its ability to resist water and longevity before reapplication becomes necessary. 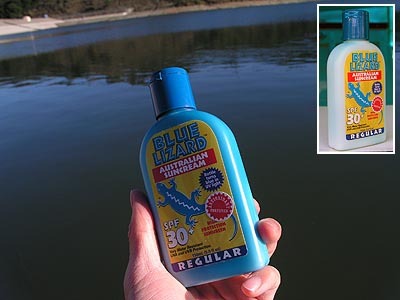 Application: Before heading out on your fishing adventure, be sure to apply the Blue Lizard suncream 30 minutes prior. That's because you want the sunblock to absorb and adhere to your skin, especially if you're going to be doing water sports where you will get wet on your arms and hands. The Blue Lizard sunscreen is thick for a Regular and goes on smoothly. Most physical sunscreen are greasy but I like the composition of the Blue Lizard which I found less oily than other brands. 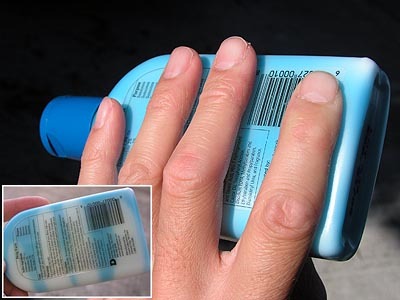 A handy feature that comes with the suncream is the unique Blue Lizard bottle. When the "Smart Bottle" detects UV light it will automatically start to turn blue. This is a first-rate indicator, and reminder, for you to put on the sunscreen before it's too late. We left the Blue Lizard bottle on the deck of the boat when we headed out of the harbor before sunrise targeting King Salmon. The morning sky was covered with heavy fog until almost noon time, but even when our eyes cannot see UV light they are present. Having the "Smart Bottle" on deck signaled the crew who didn't put on sunblock prior to the trip to quickly grab the blue bottle and apply a layer of protection on their skin, even on a foggy day without any sunshine. Protection: Skin cancer is a serious matter, and anglers who are out fishing must protect themselves against the harmful sun rays. When using the Blue Lizard on hot Spring days that had record breaking heat, the suncream provided good protection against the scorching sun, its UV rays, and reflections off the water. Our results were from following the instructions on the bottle most of the time, except the reapplication in every 2 hours. No sunburn nor reddish skin was noticeable after each full day of use. Its thick formula and the abilities of a physical reflective sunscreen did the job well even when we stuck our arms and hands into the water to bring up the fish. The sunblock didn't wash away, and the Blue Lizard provided solid protection. If you do plan on participating in more watersports where you're in the water for an extended period of time, Blue Lizard does produce a "Blue Lizard Sport" where the sunscreen is thicker than the regular one we tested. Sometimes using a lotion comes with a price. Such things could be allergic reactions, clogging pores, and having the sunscreen run down your face and into your eyes when you sweat. 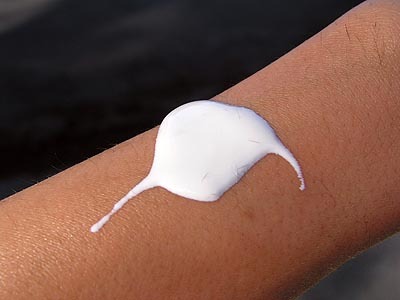 This is something we always look into when trying out a new sunblock lotion. It cannot exhibit these annoyances or we won't approve of it. Being allergic to a few kinds of sunscreen, the Blue Lizard cause no reactions on my skin and rashes weren't a concern with this zinc based formula. The Australian-made sunscreen continuous to impress. While fishing in extreme heat we were sweating throughout the day but never once did the Blue Lizard suncream roll down into our eyes, causing the nasty burning sensation we have felt when using other chemical based products. Longevity: From all of the different sunscreens I've tried, the greasier the lotion the longer it seems to last, but who likes to feel like they've been smeared with oil all over their arms, legs, and face? I sure don't. So how long does this suncream last? Blue Lizard and other manufacturers of sunscreen recommend that anglers who are out fishing in direct heat should reapply every 2 hours for full UV protection. The test results for the Blue Lizard showed it provided at least 4 hours of protection without getting sunburned. Its thick composition helps keep the UV rays off and also keeps your skin moist. Because FDA requires all sunblock lotions to be tested in still water for only 80 minutes, no one brand will be waterproof throughout the entire day of use when you're submerged in water. That's not a problem with fishermen since the only part we dunk in the water are our arms and hands when landing a fish, unless you accidentally fall into the water, at which time sunburns probably are not your number one priority. 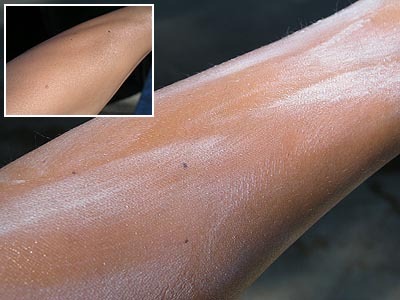 Most anglers won't have any problems in this area, but we stress tested it anyways and found that the heavy formula held onto the skin well if applied at least 30 minutes before fishing as directed. The suncream didn't get washed away throughout the day and it also provided a superior barrier between your skin and the water, having the water bead off as we lifted our arms out of the water after lipping fish. Conclusion: Skin cancer is on the rise, and those who enjoy outdoor activities like fishing are even more prone to exposure. Luckily we have new ways to protect ourselves from the sun's harmful UV rays. Blue Lizard, developed in Australia where the summer sun is extremely damaging to the human skin, is a physical suncream that reflects UV light throughout the spectrum, providing maximum defense against the sun's deadly radiation. This sunscreen is thick, goes on smoothly and adheres fast, does not cause allergic reactions, and won't clog pores like some others we have tested. The next time you are out fishing, don't forget to check your smart bottle, for when it becomes blue you know its time to start applying Blue Lizard armor.